Courtesy of David Markland, here are some photos from Sunday’s sold out Real Black Dahlia Crime Bus Tour. The following is from our latest 1947project press release… even if you don’t ride the Crime Bus, you can still enjoy these treats at Scoops at 712 N. Heliotrope Dr., just north of Melrose, on Friday 9/15 and Saturday 9/16 from 12pm-9pm. LOS ANGELES- All Elizabeth Short wanted in life was to be someone. Now, nearly 60 years after her death, the victim of L.A.’s most notorious unsolved murder is honored with a new film, a citywide tour, and twelve unique gelato concoctions from distinguished ice cream artisan Tai Kim. Short joins the ranks of celebrated people with foods named for them, like opera star Nellie Melba (Peach Melba), chef Alfredo de Lelio (Fettucine Alfredo), Brown Derby owner Robert Cobb (Cobb Salad), Jerry Garcia (Ben & Jerry’s Cherry Garcia) and Napoleon Bonaparte (Napoleon pastries). To coincide with the September 15 release of Brian De Palma’s “The Black Dahlia,” the 1947project Crime Bus offers a guided luxury tour to dozens of sites that played a part in the real life and death of Elizabeth Short, as well as locations figuring in her posthumous myth. On The Real Black Dahlia Crime Bus Tour, Kim Cooper and Nathan Marsak guide their passengers to more than two dozen scenes from the real and imaginary history of the Black Dahlia case. Along the way, they’ll explore the social history of postwar Los Angeles, several Black Dahlia killer theories will be debunked and a little known but likely suspect will be introduced. The tour will bring to life the real Elizabeth Short and some of the peculiar characters who knew her in life or become obsessed with her in death. As the Crime Bus winds it way towards its downtown conclusion, the passengers will coming closer to a very special treat. 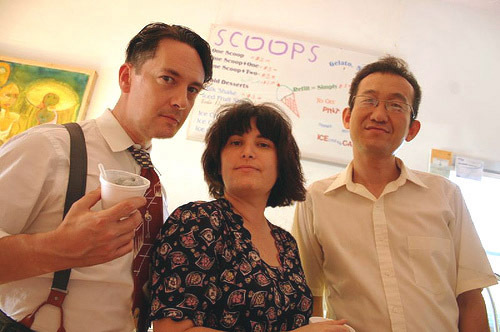 The 1947project asked avant-garde gelato maker Tai Kim of Scoops in East Hollywood to create a new flavor, named after the Black Dahlia, to honor her memory and provide sustenance to the brave Crime Bus passengers. Tai responded by developing not one but twelve unique flavors, each of which reflects Elizabeth Short and her time and city: 1947 Los Angeles. These special gelatos will only be available on Friday 9/15 and Saturday 9/16, and on Sunday 9/17 for Crime Bus passengers exclusively. So what does the Black Dahlia gelato taste like? According to Tai, like White Licorice (an anise and lemon blend), Black Tea and Rosewater, Blackberry and Orange Blossom, Pomegranate and Poppy Seed, Blood Orange Sorbet, Black Currant with Blueberry and Anise Sorbet, Dark Chocolate and Raspberry, White Chocolate and Black Sea Salt Mousse, White Chocolate and Cranberry Syrup, Vanilla and Whiskey and Jasmine Tea and Raisin. An additional offering is Chunky Apple Rum, a flavor that was popular in the 1940s and which Elizabeth Short may have enjoyed in life.